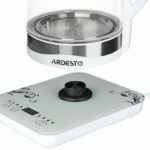 Transparent glass electric kettle with technological platform, touch control, temperature control, LED backlighting and overheating protection. 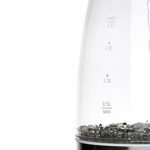 Kettle’s capacity is 1.8 l, the platform provides a 360° rotation. The platform, base and handle are made of black polycarbonate and brushed metal. 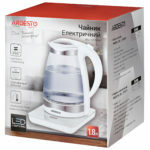 The main part of the kettle is made of durable tempered glass with volume marks — 0.5 l, 1 l, 1.5 l and 1.8 l.
For comfortable use there is a convenient handle with an opening button. The touch control panel with a display is located on a stand and is decorated with a pattern. The wire length is 70 cm. 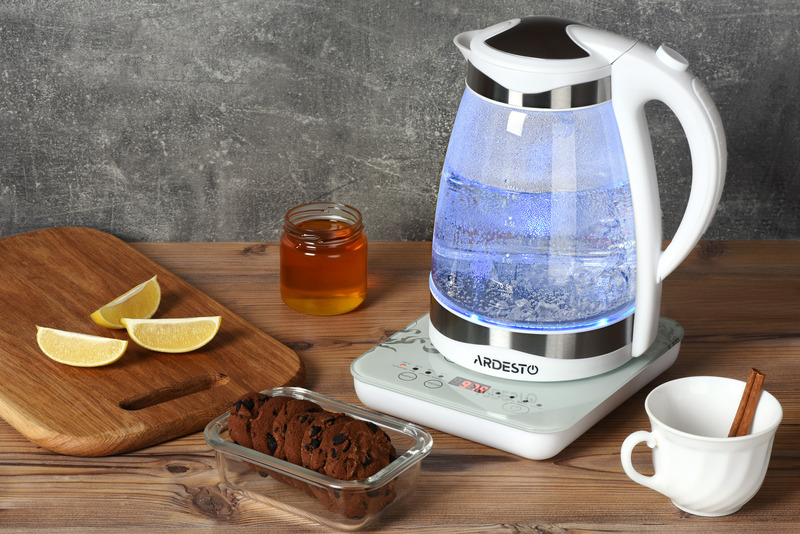 There are seven modes of heating and maintaining the water temperature for different types of tea, coffee, milk, and water with honey. The performance of the glass kettle is accompanied by a blue LED lightning. The heating element is hidden. Its effective location with a power of 1800 W does not overload the grid and allows not only to significantly reduce energy consumption, but also to ensure faster achievement of a given temperature. Due to this, less energy is consumed and the house ecology is maintained. It also provides durable overheating protection and automatic shutdown when there is no water inside.